“Ministers have been saying a lot about accountability recently so now let’s apply that to climate change policy and scrutinize what they are up to in the light of the facts and the application of sound science. “Gordon Brown is holding a very welcome inquiry into the war on Iraq. This is excellent but it would have been better for the world to have had the facts rather than a war in the name of bogus ‘Weapons of Mass Destruction’. – Why did so many children starve to death from food and fuel price rises caused by biofuels and costly energy projects? – Why was the development of Africa held back in the name of green ideology? 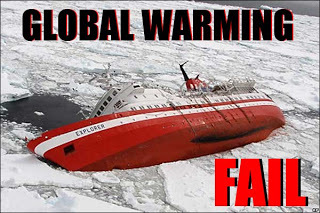 – Why did they repeatedly fail to act on extreme weather event warnings which killed thousands but were ignored because the science used in those forecasts didn’t accord with the new green religion? – Why did the UK Government continue to rely on failed forecasting systems which cost the UK economy £3billion in the winter of 2008/9 when road salt ran out because the Met Office had forecasted a mild winter. 1. Contrary to the projections of the UN and Governments the world has been cooling since 2002/3 while CO2 has been rising rapidly. 2. Global warming is over and it never was anything to do with mankind. There is no evidence that CO2 fluctuations in the last 200, 2,000 or 20,000 years have caused warming or climate change, in fact the evidence is the other way around. 3. There is no evidence of more extreme weather events or increases in the rate of sea level rise or changes in glaciers corresponding to CO2 increases since the industrial revolution. 4. All changes in the Arctic and Antarctic follow natural and highly variable patterns which are not new or special and have been recorded for over a thousand years and have been very well known to the British navy** for a long time and available in the Met Office library The Antarctic has been cooling for decades and the Arctic has started to cool in the last year or two. Break-up of ice is a natural process – like the falling down of old trees – and has been happening for millions of years before news media noticed it. (**HMSO 1963 Weather In the Home Fleet waters Vol 1 Northern Seas part 1 table XV page 246 shows the very high variability of ice off Iceland (eg) since 1900 and the long periods of change of two decades or more. Figures 124 & 125 (page 256) show that historical records indicate there was no pack ice off Iceland for about 180 years from 1020AD to 1200AD yet there was plenty of pack ice through the rapid expansion of industry since 1900 (Fig 126 page 257). This 120 year late medieval warm period is many times longer than the supposedly alarming present experience of the Arctic. 5. All the UN & Govt forecasts of ongoing warming this century have failed and the UN has still refused to produce evidence of their claims despite reasonable requests by an international group of science experts. 6. Extreme weather and climate change events can be predicted months or years ahead using solar activity whereas standard meteorology and CO2 dogma cannot do this. 7. The Met office long range forecasts for summer 2007, summer 2008 and winter 2008/09 were the opposite of what occurred while solar-based (Solar Weather Technique) forecasts correctly foresaw the floods, more floods and heavy snow in each of those seasons. “The climate alarm modelers live by hype and government hand-outs and use weasel words to explain away their failures while in fact they know not what they are doing. The current deluge of climate fantasy serves to convince the public to worry about things which will never happen. They say they are using the best forecast systems they have but let us be clear the best of failures have little merit. Frankly the best computer models they use are just more rubbish in to get more rubbish out.